On an artificial island in the middle of the bridge, perched over the River Regnitz, boldly stand the old town hall of Bamberg.The Altes Rathaus has been an attraction in Bamberg since 1386. The town hall was reconstructed between 1744 and 1756.The magnificent frescos over the façade illustrate how the town was built over the island. The building is well decorated with allegorical paintings on both sides and beautifully designed in baroque architecture. 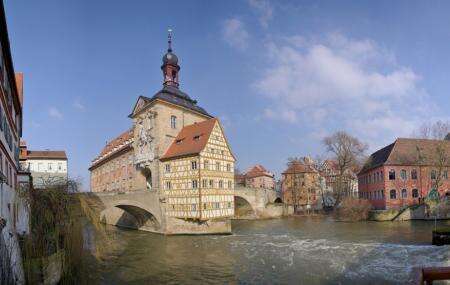 The Altes Rathaus is popular for its beauty and is a recommended visit in the city of Bamberg. Carry your camera because you may want to take pictures. How popular is Altes Rathaus? People normally club together Diocesan Museum and Klein Venedig while planning their visit to Altes Rathaus.